Coyote sightings tend to increase this time of year as February is peak mating season. "It's a territorial call a lot of times," says Great Parks of Hamilton County Nature Interpreter Angela Marczi. "It says 'Hey, we're here. This is our territory.' And then the neighbors will start up and say 'Okay, well, we're over here and this is our territory.' 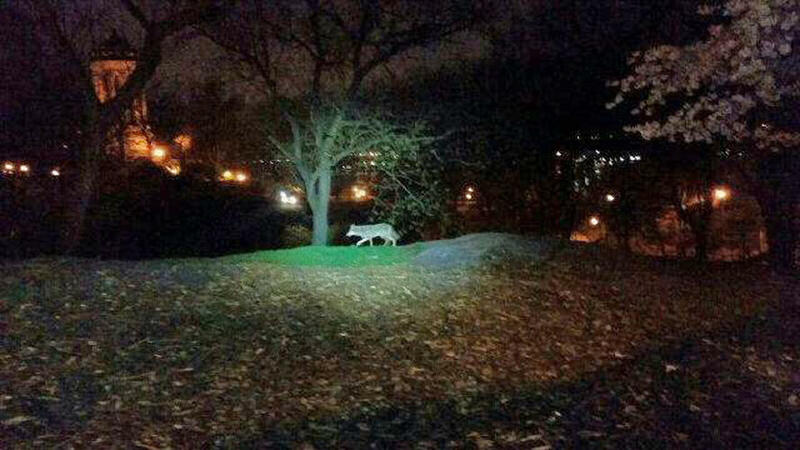 "
Great Parks says increased coyote sightings this time of year aren't surprising. Mid-February is the height of coyote mating season. Coyotes are very adaptable, capable of living alongside humans in cities and often staying out of sight. The park district is on a mission to inform people coyotes aren't the threat some may believe. "They don't want to be around people. They don't want to be in close proximity to people. Their natural instinct is to stay as far away from us as possible," Marczi says. Coyotes are considered the top predator in Ohio, and they fall into what Marczi calls a "golden window" where they're just the right size to prey on smaller animals and some bigger animals like sick or injured deer. So, yes, coyotes may find puppies, kittens and small dogs or cats an easy source of food if they're left unattended outside at night. However, Marczi says the threat to pets is "not as much as it has been advertised or supposed that it would be." The best way to keep coyotes away is for humans to stop providing attractants enticing the animals to come closer to us than they normally would. "Make sure your garbage cans have tightly fitting lids. Make sure you don't put bags of garbage outside your garbage cans; that there are no strong smells. Any pet food that you might leave outside - dog food, cat food - bring that inside at night. And if you do have a very small pet, when you're outside with them supervise them and don't leave them out at night." If you do happen to come in contact with a coyote, Marczi recommends yelling at it or throwing something in its general direction - not at it - and the animal will likely go away. With coyotes being Ohio's top predator, Marczi says they're not going away. In addition to preying on sick/injured deer and fawns, they help keep Canada geese populations in check by preying on goslings and goose eggs. They also prey on feral cats, which has a positive effect on Ohio's migratory songbird population. Marczi points out feral cats prey on migratory songbirds, so when coyotes cut down the feral cat population, the bird population goes back up. Great Parks is hosting four programs on coexisting with urban coyotes. "These animals are to be admired," says Marczi. "Our purpose in doing these programs is not only to tell people how to coexist with them, but to help build appreciation for this unique and adaptable animal." Each program begins at 7 p.m. and naturalists will be on hand to answer additional questions or concerns. February 6: Farbach-Werner Nature Preserve, Ellenwood Nature Barn, 3455 Poole Rd, Colerain Twp. You can now use your smartphone to check out that local hiking trail before you set out. Images of trails throughout 16 Hamilton County parks were captured in spring and summer last year and are now available on Google Maps.